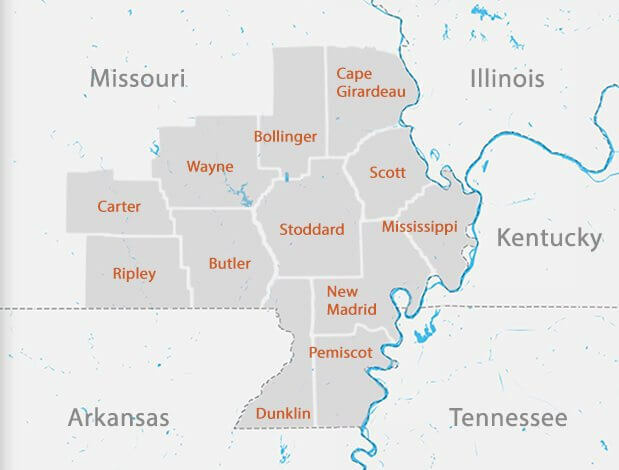 Farm Credit Southeast Missouri President & CEO Bob Smith is pleased to announce that the Board of Directors has declared a 2018 cash patronage refund of $7.1 million to the borrowing members – the largest in the program’s history. Farm Credit Southeast Missouri President & CEO Bob Smith is very pleased to congratulate Janet Jordan, Customer Service Representative, on reaching 20 years of service with Farm Credit. Farm Credit Southeast Missouri President & CEO Bob Smith is very pleased to congratulate Kim Hicks, Customer Service Representative, on reaching 5 years of service with Farm Credit. Farm Credit Southeast Missouri President & CEO Bob Smith is very pleased to congratulate Ben Kellams, Loan Officer, on reaching 15 years of service with Farm Credit. Farm Credit Southeast Missouri President & CEO Bob Smith is very pleased to congratulate Pam Sherrod, Customer Service Representative, on reaching 5 years of service with Farm Credit. Farm Credit Southeast Missouri President & CEO Bob Smith is very pleased to congratulate Tammy Tucker, Loan Operations Specialist, on reaching 20 years of service with Farm Credit. Farm Credit Southeast Missouri President & CEO Bob Smith is pleased to announce that Sandi Campbell has accepted the position of Customer Service Representative at the Sikeston Branch. Farm Credit Southeast Missouri President & CEO Bob Smith is pleased to announce that Jennifer Collier has been selected to be the association Controller. After 31 years of service with Farm Credit Southeast Missouri, Mary Winkler, Customer Service Representative at the Jackson Branch, is set to retire on May 31, 2018. Farm Credit Southeast Missouri President & CEO Bob Smith is pleased to announce that Chelsea Foster has accepted the position of Loan Accounting Analyst at the Central Office. Farm Credit Southeast Missouri President & CEO Bob Smith is pleased to announce that Jamie Douglas has accepted the position of Senior Risk Management Specialist at the Poplar Bluff Branch. Farm Credit Southeast Missouri President & CEO Bob Smith is pleased to announce that Tracy Taylor has accepted the position of Customer Service Representative at the Kennett Branch. Farm Credit Southeast Missouri President & CEO Bob Smith is very pleased to congratulate Mindi Fitzgerald, Customer Service Representative, on reaching 10 years of service with Farm Credit. Farm Credit Southeast Missouri President & CEO Bob Smith is very pleased to congratulate Stephanie Burger, HR Administrator & Senior Accountant, on reaching 15 years of service with Farm Credit. Farm Credit Southeast Missouri President & CEO Bob Smith is very pleased to congratulate Chad Crow, Senior Vice President/Senior Relationship Officer, on reaching 15 years of service with Farm Credit. Farm Credit Southeast Missouri President & CEO Bob Smith is very pleased to congratulate Mark Zabelin, Vice President/Branch Manager at the Dexter Branch, on reaching 15 years of service with Farm Credit. Farm Credit Southeast Missouri President & CEO Bob Smith is very pleased to congratulate Kirk Mueller, Vice President/Branch Manager at the Jackson Branch, on reaching 20 years of service with Farm Credit. Farm Credit Southeast Missouri President & CEO Bob Smith is pleased to announce that Amy Bullock has accepted the position of Risk Management Specialist at the Kennett Branch. Farm Credit Southeast Missouri President & CEO Bob Smith is pleased to announce that the Board of Directors has declared a 2017 cash patronage refund of $7 million to the borrowing members – the largest in the program’s history. Farm Credit Southeast Missouri President & CEO Bob Smith is pleased to announce that Nathan Creed has accepted the position of Loan Officer at the Kennett Branch. Dear Customer-Owners: I’m just going to come right out and say it – we’re changing our name! Effective January 1, 2018, our new name will be FARM CREDIT SOUTHEAST MISSOURI. Progressive Farm Credit Services President & CEO Bob Smith is very pleased to announce that Randy Caldwell has been promoted to Senior Vice President/Senior Relationship Officer. Caldwell’s primary responsibility will be business development in the three Progressive Farm Credit branch offices of Kennett, Portageville, and Poplar Bluff. Progressive Farm Credit Services President & CEO Bob Smith is very pleased to congratulate Anna Harper on reaching 40 years of service and Andrew Hill on reaching 25 years of service with Progressive Farm Credit Services. PFCS President Bob Smith and Director Phil Showmaker attended Farm Credit Council’s National Director Conference & Fly-In in Washington DC. PFCS President & CEO Bob Smith is pleased to announce that John Dixon has accepted the position of Loan Officer at the Dexter Branch. PFCS President & CEO Bob Smith is very pleased to announce that Alan Hicks has been promoted to Senior Vice President/Senior Relationship Officer. Hicks’ primary responsibility will be business development in the three Progressive Farm Credit branch offices of Poplar Bluff, Dexter, and Kennett. PFCS President & CEO Bob Smith is very pleased to announce that Mark Zabelin has been promoted to Vice President/Branch Manager at the Dexter Branch effective June 1st, 2017. Make plans now to attend a seminar on tax planning, entity structure and transition planning featuring Paul Neiffer sponsored by Farm Credit Southeast Missouri and FCS Financial. Progressive Farm Credit Services President & CEO Bob Smith is pleased to announce that for the 22nd consecutive year a Patronage Dividend will be paid back to its borrowers. The 2015 patronage totals $5.25 million. The incoming President & CEO of Progressive Farm Credit Services, Bob Smith, has announced that Chad Crow has been promoted to senior vice president/chief operations & marketing officer at their corporate office; and Heather Couch has been promoted to vice president/branch manager at the Sikeston branch. Both appointments were effective October 1. July 17, 2015 marks the beginning of Farm Credit’s 100th year. This is an achievement reached by few, and it comes at a time when Farm Credit’s role in agriculture and rural America is as important as ever. Board Chairman Mark Yarbro has announced that Robert (Bob) Smith will be the next President and Chief Executive Officer of Progressive Farm Credit Services. Bob will assume the role of incoming CEO on September 1, 2015 with several months of transition before the retirement of current CEO Ron Milbach towards the end of the year. University of Missouri Extension will hold a meeting on the Farm Bill on November 10 in Miner, Missouri*. This informational meeting will provide farmers, landowners, and other interested parties the most up-to-date information on the new farm bill. The meeting will cover decisions that farmers and landowners need to make in respect to base acre reallocation, yield updating, and PLC, ARC county and individual program choices. In addition, program decision tools will be demonstrated to assist in making the Farm Bill decisions. The 2014 Missouri Young Farmers/Young Farm Wives Ag Tour, hosted by SEMO Ag Leaders, was held in Stoddard County July 31st through August 2nd. Heather DeWitt Couch, a loan officer at the Sikeston branch, traveled with Restore Haiti in July to spend a week working on a home and feeding children in Jacmel. Local Farmers' Markets Open For Business! Local farmers' markets are now open. Come visit them to pick-up some fresh high-quality food and support your local farmers. Progressive Farm Credit Services is planning their annual customer appreciation events throughout Southeast Missouri. 2012 Annual Stockholders Meeting results are in. Congratulations to our two new directors. Featured Artilce in Progressive FCS's Neighbors Newsletter profiles Kevin Hughes, a Customer of the Sikeston branch office. Have Hail Damage And Need To File A Claim? What To Do Next. Have Hail Insurance and received hail damage from a recent T'storm, call your Risk Management Agent to file a claim. Farmers' markets are kicking off all around Southeast Missouri in the coming weeks with fresh locally grown fruits and vegetables. Progressive Farm Credit Services would like to thank Della Hubbard for 20-plus years of service. What to Expect When Requesting a Real Estate Loan! We outline the process of obtaining a real estate loan from receiving a complete application to closing. Check out the Winter 2011 Neighbors Newsletter with the latest Farm Credit happenings.